Update: The Salo movie from 2018 clearly is now canon and established how in fact the run can be done. Now that the Star Wars canon has had a shake up, a lot of things that used to be considered canon are no longer the true version of the story. So there’s no General Thrawn or Truce at Bakura for example that currently ‘exist’. And if you think about it, the explanation of the Kessel Run being done by Han Solo and Chewie in less than 12 parsecs means the ‘mistake’ of the original film remains (in that everyone with a science major knows a parsec is a unit of distance rather than a measurement of time). Following the success of the film, this seeming error was pointed out many times by fans so much so that the Han Solo trilogy of books explained that the Kessel Run’s distance was shortened when Han flew close to a black hole which cut the distance down. But this whole parsec thing is a bit stupid anyway. Solo "It's the ship that made the Kessel run in less than twelve parsecs!" Which means the line was simply intended to be some nonsense Han just threw out into the conversation. The novelisation of the film however did pick up on the use of the word and changed the distance measurement to “standard time units”. Now, you might think that the mention of the famous run in The Force Awakens addresses the issue. THink carefully about this and you will see it's not the case. 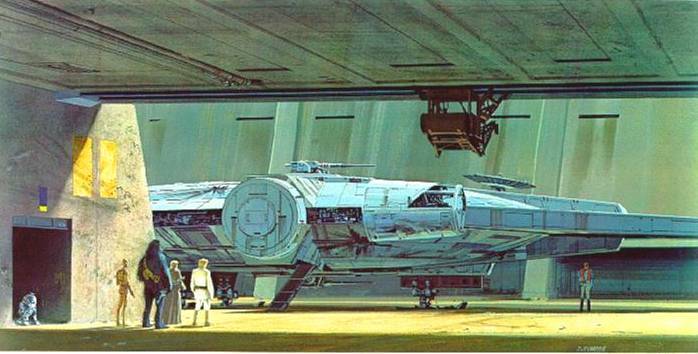 The Force Awakens did not explain how the Kessel Run was achieved, it merely referenced it. So until any new Star Wars material mentions the parsec run explanation, it simply does not exist in the Star Wars universe and Han Solo was merely trying to impress Obi-Wan by lying as confirmed by the script notes. It's already mentioned in TFA, Rey says "This is the ship that made the Kessel run in fourteen parsecs" to which Han replies "Twelve! fourteen(sarcastically)". So, it's canon, your article is bad and you should feel bad. I'm talking about the explanation for it, not it's mere mention. The explanation for it was made in other Star Wars expanded universe material. It is not explained in TFA. My argument still stands and your comment is bad and you should feel bad. But not really because we love you. Thanks for checking in. What I saw in TFA was a tongue-in-cheek line to mess with the fans, like if they had mentioned "Han shot first". The original 12 parsecs thing was simply a script mistake, and instead of going for the 100th attempt to "fix" it with an explanation, they decided to use it as a joke (which I found funny) leaving it as ambiguous as ever. Wondering about the meaning of parsecs in the SW universe is at this point futile - if it wasn't already nearly 40 years ago. Given how stupid TFA is, I've decided that the Expanded Universe IS canon and anything Disney puts out is merely "Legend". That way, things make sense. Plus, now Disney has introduced Thrawn (as a Grand Admiral)...so maybe Disney is slowly realizing that the EU should have remained as canon anyway. So, the original script goof has been explained! End of story (in my view).